The other night I had a dream about a young man, perhaps late teens to early twenties, who was insistent on having his one question answered. In my dream, no one adequately answered his question. As I was in that dreamy stupor of almost awake and still half asleep, I began to ask the Lord the very same question. At first, I couldn’t understand why suddenly this was important to me. But certain scriptures kept coming to mind. As I finally came to myself that morning, the question kept lingering in the back of my mind. Why, Lord, must I obey you? Now before you have a panic attack that I’m about to give every person in the universe the license to sin, hear me out. As bantered with God about this matter, it became very evident it’s true. I am not required or forced to obey God. Eve didn’t. Adam didn’t. Moses didn’t. Neither did Jonah, or David, or Solomon… or a host of other notables in biblical history and since. The fact remains, I obey God because I love Him. And I love Him because I have come to understand the grave and real sacrifice He made for me through His Son Jesus Christ. Jesus tells us if we love him then we will keep God’s commands. And that it is the love of God that constrains us. And that’s when it became clear! When I choose to obey Him, I become purified… sanctified… blessed… joyous… strengthened… courageous… protected. In other words, obedience is the key to unlocking the wealth of promises and guarantees that comes with walking uprightly before God. I’m not more saved when I obey, and am certainly no less saved when I disobey. Rather, obedience allows the miraculous work of the Holy Spirit to take fuller hold of me. My character is enhanced. My testimony is strengthened. And my intimacy with the one true God is deepened. So sisters, the truth is, you are not obligated obey God. But if you love Him, you will. And when you do, there is a glorious reward awaiting you. 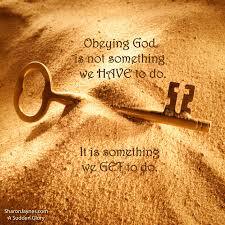 Is there something you need to obey God in today? Do that one thing, no matter how difficult it may feel, and watch God open the windows of heaven just for you! Diera Shaw-Mendez is thrilled to be part of the team at Barbara’s Place, and also serves as worship leader and youth leader at New Beginnings Worship Center in Pennsauken, NJ. She is wife to Chaplain Juan Mendez and mama to Olivia Joy. She enjoys graphic design, event planning, and cooking. Diera is a God-fearing, Starbucks-loving, tech junkie (…in that order!) who simply wants to remind women of God’s unchanging, healing love.